This weekend, twenty-five years ago, it was all about The Persian Gulf and the U.S. decision to re-flag Kuwaiti Oil Tankers within the next ten days. 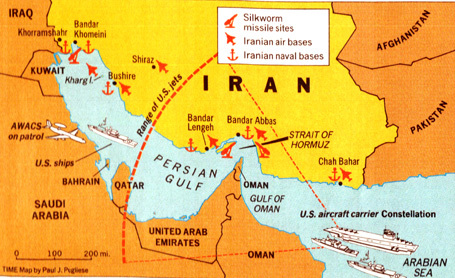 Amid reports that Iran was mining the Gulf and the U.S. was inching closer to a shooting war. With the Iraqi bombing of the USS Stark, which claimed 37 crewmen, it would seem a showdown was inevitable. Despite all that, there was no concrete Policy in place, with reference to our position on The Persian Gulf. This episode of Face The Nation was titled "Persian Gulf Policy: A Sea Of Confusion", and it reflected just how off the charts we were in handling crises overseas. Joining Moderator Leslie Stahl were Under-Secretary of State Michael Armacost and Chairman of The House Armed Services Committe, Les Aspin, discussing what was becoming a fractured and and confusing policy and whether or not the re-flagging of Kuwaiti ships should be postponed. Here is that broadcast. You get to decide.